As Francois Hollande prepares to meet Nicolas Sarkozy in the presidential run-off, RT spoke to the spokesperson of the Socialist Party, Benoit Hamon, on the challenges France is facing – austerity measures, immigration and military interventions. ­RT: Our first question of course will be on the future of France. 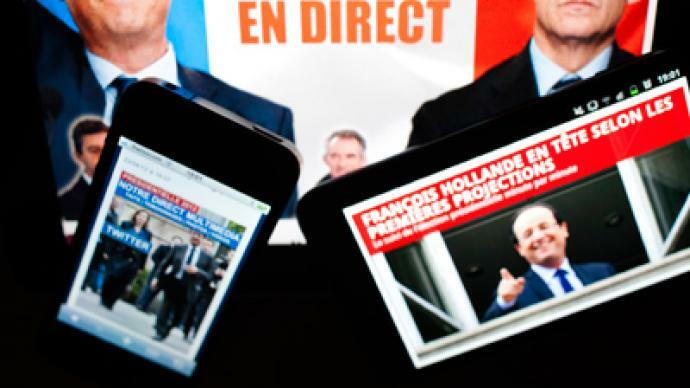 There are two top candidates now – the socialist Francois Hollande and incumbent Nicolas Sarkozy. 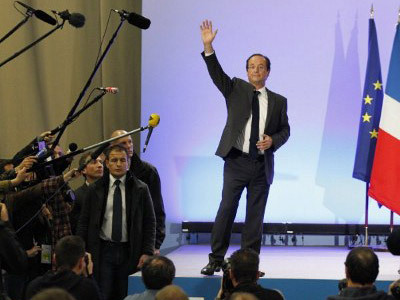 What kind of France are we going to see with an Hollande presidency? Benoit Hamon: Probably a France that's much fairer, much more egalitarian than it is today. 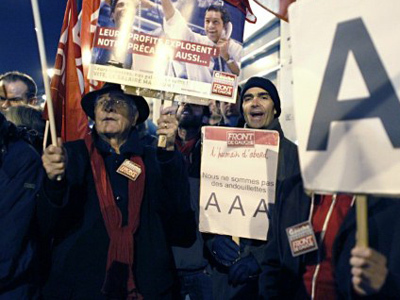 The France we inherit today is significantly poorer than it was five years ago. She has probably lost her influence in the world with, for example, the failure of the Union for the Mediterranean. She has lost much of her influence in Europe, and the best example of this is how Angela Merkel and Nicolas Sarkozy have agreed on a draft European treaty which is very favorable to German interests and very unfavorable to the interests of the rest of Europe. France is mostly very divided as we inherit it today. The task for Francois Hollande will be to somehow repair, rebuild and assemble the French, to avoid opposition to one another. This is why his political project is intended primarily to address inequalities. RT: So you're talking about redefining or reestablishing France's role and influence in Europe. You bring up the treaty. Francois Hollande does want to renegotiate the fiscal pact agreed upon by EU leaders. But how much leverage does he really have? He's going to go up against German Chancellor Angela Merkel and, let's be frank, what she wants usually plays a very important role in EU decision-making. BH: His message is clear. If the treaty is not renegotiated, France will not ratify it, and therefore, it cannot come into force. If Merkel wants to impose fiscal discipline in the eurozone area, we will require a "growth measure" in the treaty. Where now, there is none. We want to make progress on Eurobonds. We want to expand the role of the European Central Bank. There is no question for us that we would not accept a treaty that would result in austerity measures in France, and throughout Europe at the same time. Most of our growth is related to trade within the EU. If the French cannot buy and companies cannot invest because of austerity policies, then our neighbors can neither buy nor invest either because they too practice austerity. We believe that Merkel is prepared to hear that. We are simply saying that the treaty cannot proceed only under the terms of Germany's economy. In fact, this treaty does not benefit the Italian economy, nor the Spanish, nor the French economy. Our great regret is that Nicolas Sarkozy has not defended the interests of the French economy or the economies of many European countries. 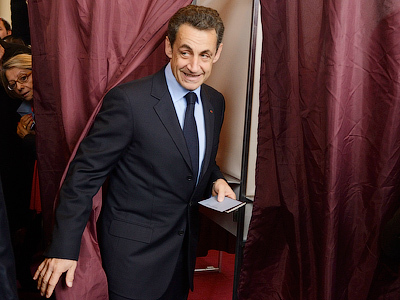 Sarkozy agreed to sign the treaty to appear a protector of France, Europe and of the eurozone. For simple public relations purposes, he signed a treaty that we consider bad, because it focuses only on austerity. RT: Talking about austerity, are you against austerity, are you against all types of belt-tightening measures? Do you not see any merit to it? And speaking about growth measures that Francois Hollande keeps bringing up, what does it really mean? RT:Let's talk about immigration. Other presidential candidates such as the National Front's Marine Le Pen, and even Nicolas Sarkozy, keep bringing up the problem of immigration, using this as a campaign point. What is your view on immigration in France in general, and in particular illegal immigration? BH: Quite honestly, immigration, being an economic and social problem, is primarily a political problem. In many European countries, the issue is systematically used to say that immigration is a threat to the country. When they talk about immigration, they usually mean Arab, African and Muslim. This is the way people approach the immigration question in the political debate in France and Europe. In France, what the president of the republic said were nothing but caricatures. It will reach the point where a great number of Anglo-Saxon newspapers can no longer see the difference between what Marine Le Pen and Nicolas Sarkozy say about Islam and immigration. This is a major setback for France to see that the president today finds inspiration in the program of France's far-right. This is a very grave step back. What we're saying is that we need to discuss the conditions of economic immigration and the needs of different sectors of the French economy. If we must add rules to economic immigration, we will do so. We don't want to make immigration an issue used to divide and frighten the French. This is a serious matter that must be treated as such and must be subject to political, economic and social responses. It should not be a subject used by Nicolas Sarkozy or Le Pen to win votes and raise racism in France. For five years, the French reality is the rise of intolerance and violence, it is perhaps more racist than it was five years ago. Yes, there is discrimination in hiring. Yes, there is discrimination in access to housing. And yes, there is discrimination in access to leisure. It depends on whether you have a white face like mine, and a name like mine, and a position like mine with the socialist party. Or your name is Kader, of Arab or North African origin, or Omar from Mali. RT: Let's talk about NATO and France's participation in its campaigns in various countries. Now Francois Hollande wants to withdraw more troops from Afghanistan earlier than planned, however he doesn't want to withdraw, pull out France completely from NATO. BH: Regarding NATO, we want to evaluate the decision made by Nicolas Sarkozy to rejoin the integrated military command of NATO. We are not sure that our reintegration into the military command has had the expected results. Above all, what we regret is that there has been no strong initiative of France in favor of a genuine European defense system for five years. We do not believe today that European defense, and protection of the broader strategic interests of Europe and the European Union, can be supported only by NATO. We consider it necessary to develop autonomous structures. That's why we insist on developing a European Defense. We will evaluate the benefits and drawbacks involved with the return to the integrated military command of NATO. And I'll add, as you said, in connection with our allies, so as not to destabilize NATO in Afghanistan, we will withdraw our troops from Afghanistan before the end of 2012. RT:So you want to reassess France's participation and Francois Hollande wants more cooperation in this European Defense System. However, by pulling out troops from Afghanistan earlier than planned, wouldn't that sour relationships with Britain, or Germany for example, who are investing a lot in that effort? BH: Our analysis is that our military intervention is not able to add a value that allows a peaceful solution of the crisis and the conflict in Afghanistan. By our military intervention there, we lost our ability to act on political and diplomatic levels. We want to regain freedom and room to maneuver politically and diplomatically in order to find a political solution together with major regional players in the conflict. That requires first to withdraw our troops from Afghanistan. We believe that a military solution is doomed to deadlock. We do not believe that the solution to the conflict in Afghanistan requires a military-only approach, otherwise we would have resolved this conflict already. The last synchronized attacks by the Taliban in many parts of Afghanistan show that there is no longer any area in Afghanistan today that is truly protected. France and Europe must find ways to influence the immediate neighbors of Afghanistan, the large regional players, in order to find a political solution to the Afghan conflict. A military operation must one day come to an end and we think it is now time for that. RT: So you talk of "political solutions" here. Does that apply as well to Syria for example? BH: Syria is on the edge of civil war. The proof is that, despite the Annan plan, there are still dozens and dozens of deaths, hundreds of deaths. I want to come to talk about the role of Russia in this matter. By its place in the Security Council and through the role it can play with the Syrian regime, Russia is in a key position to unlock the Syrian situation and avoid a bloodbath and civil war. Both at levels of bilateral Franco-Russian relations and on the level of the EU-Russia relationship – we want a rich, intense association with Russia. We also want its role on the international scene to contribute to stability. We can understand the historical relations of the Russian state with the Syrian state. But today, Bashar al-Assad is a destabilizing factor in his country but also the whole region, we must respond in a concerted and coordinated way between Russia, the European Union, France and permanent members of the Security Council. Can a Military intervention go through NATO in Syria? At this point, it seems premature. And this is why the plan by Kofi Annan opened the possibility of a political solution with the involvement of observers. In fact, considering the number of observers who will go there, and the difficulty in verifying whether or not atrocities are committed against civilians, there should be a strong force in place to ensure that observers really do observe what happens. RT: But France played a very big and central role in the Libyan “intervention”. BH: In Libya, we played two different roles. 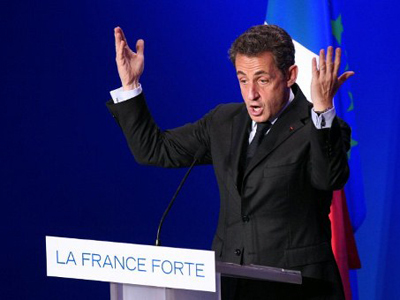 At one point, Nicolas Sarkozy wanted to sell nuclear power plants to Gaddafi, then he bombed Gaddafi. 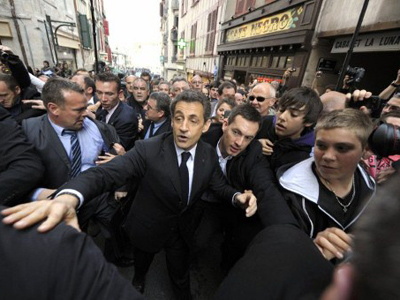 When you are a friend of Nicolas Sarkozy, always be wary! 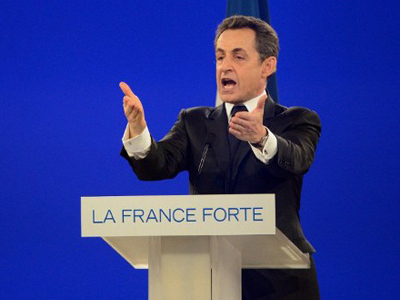 It shows the completely incoherent nature of Nicolas Sarkozy's foreign policy. I think the intervention in Libya was necessary because Gaddafi used its armed forces and bombs against his own people. But that does not mean that the situation is now stabilized. We observe that the movement of weapons in the Sahel region is linked to the consequences of the conflict in Libya. This helped to arm groups linked to AQIM (Al-Qaeda in Islamic Maghreb). Some of the events in Mali are related to what happened in Libya. Therefore, we need stabilization policies, growth and development. Here too, France has intervened to help end the Gaddafi regime. But the French development aid to developing countries fell from 0.7 per cent to 0.4 per cent of our GDP. So we give weapons, but we don't help with development, growth and job creation. As we know, if there are weapons and no jobs, there will be more instability. Francois Hollande's ambition is to focus on stabilizing the Maghreb and North Africa region, because it's a hotbed of potential unrest for Europe and beyond, including much of the African continent.